NY Spender: People at GROM, sorry but you got the ALMOND GRANITA all WRONG! People at GROM, sorry but you got the ALMOND GRANITA all WRONG! I am a Sicilian woman transplanted here in New York since the Nineties. Before that, I was born and raised in Sicily. This preface to say that I know a lot about both Sicily and New York. The white, cold and creamy stuff in the glass is the above mentioned almond granita. As I said, it's creamy and refreshing when it hits your palate. It's better than any ice they sell here in New York, as it doesn't have any of the grittiness, and it feels so smooth in your mouth that it's hard to believe that it's made out of ice. The flavor is of delicate, sweet almonds. But let me try and give you an idea: You start by pulling apart the warm top bun of the brioche and you dip it in the granita. You scoop a little granita up with the brioche and eat both the granita and the brioche together. The mix of warm and cold takes the taste buds to an exhilarating roller coaster ride of textures and flavors, but also amazement that something so good only costs three Euros. I was on vacation in Sicily just a few weeks ago, and I always try to squeeze in as many granita breaks as I possibly can in my daily meals. I even tried taking a few brioches back home with me, but they don't fly well and don't last long before they go stale. In the past, I've tried making the granita and the brioches from scratch here at home, and I would rate my results a seven out of ten, but the work involved and the time it takes to get this meal together is just too much to do on a daily or even on a monthly basis. 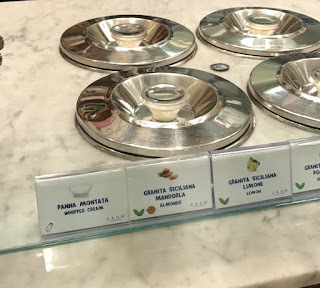 So you can imagine my happiness (obviously mixed in with a bit of skepticism) when I heard that there was an Italian gelateria named GROM in New York that made my almond granita, and that it now had a store close to my job! The next day I decided to give it a try, but before heading to Grom, I stopped by Whole Foods to buy a makeshift brioche so that I had something to dip in the granita. When I reached Grom, I could feel the excitement growing inside me while I anxiously looked around the counter for my granita. When I finally found it, my super happy taste buds started sending messages to my brain that the fun was about to begin! "You might want to have a taste before you buy it." Wait, what?!? Who would ever say anything bad about my almond granita? Maybe this person had very different food preferences than mine (it's possible)? I accept the offer on a small spoon and get ready to taste this New York almond granita, which hopefully will taste just as good as the one they make in Sicily. OMG! (And I never say OMG, but OMG!) It was DISGUSTING! I couldn't believe, actually I couldn't understand what was in my mouth! I asked to see the container with the granita: it looked like pancake batter! Almond granita looks nothing like pancake batter! And it tasted like pancake batter with a bunch of fresh crushed almond in it! It's horrible, just horrible what they are trying to pass for almond granita at Grom New York! My granita, made at home, with my Kitchen Aid Mixer tastes a hundred times better! It's such a shame. I understand that maybe Grom has this idea of fresh ingredients (crumbled almonds) on their products, but this is not how they make it in Sicily. We don't chew a granita. This one was so gross, and I am not that one disgruntled and opinionated customer... the employee knew that it tasted horrible, and felt that it was necessary to give me a warning! 1) Stop calling it a Sicilian Almond Granita, because it is NOT a Sicilian Almond Granita. Call it a chilled, crunchy almond concoction, because that's what it basically is. 2) Take a trip to Catania, Sicily, and go to any granita places on Via Etnea. I can suggest Savia and Spinella as two great granita makers. Sit down and order an almond granita with a brioche and after you finish it, cry and feel the shame on having sold such gunk to your customers. 3) Give me a call. I will teach you how to make it. Federico e Guido, ma voi siete mai venuti a New York ad assaggiare questa granita alla mandorla che fanno nelle vostre gelaterie? Ma l'avete mai assaggiata una granita a Catania? There! I hope this post won't fall on deaf ears, and Grom will learn how to make a decent almond granita (and toss that crunchy concoction in the garbage for good, because that's where it's going already anyway)! The almond granite looks like the food of the gods. If I never go to Sicily I hope to visit NY for Spender's version of it, better yet, come to LA and we can prepare it together.